Yimen, literally "gate of honor," is usually a secondary gate to a residence or grand mansion. On certain occasions, a side door or a back door also bears the name. The stele on the gate of honor in Xuhang Town says “God bless people; Longevity for everyone.” Around 250 years old, it is the oldest of its sort in Jiading. Yimen, literally “gate of honor,” is usually a secondary gate to a residence or grand mansion. On certain occasions, a side door or a back door also bears the name. At present, Jiading has at least some 40 gates of honor. They are the mostly decorated part in a traditional residence and mainly made of bricks, lime stones or cement. Apart from the ornamentation, there is also a stele as well as a date engraved on the gate. The line on the stele reflects the best wishes from the people of the house or sometimes a family motto and the date is when each residence came into being. 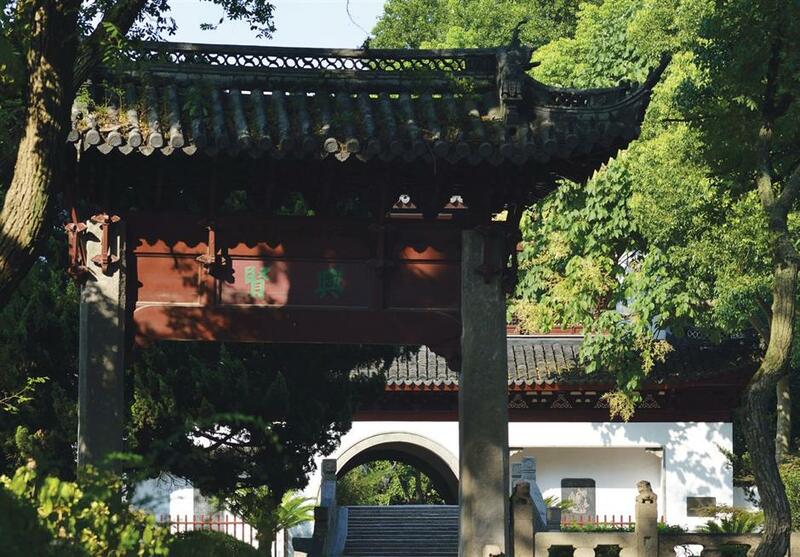 The gates of honor in Jiading can be divided into different types in line with their decorations and structures. Some of them are well decorated and with complicated structures, such as corbels and brackets, while others are simply built on a section of wall or just on a screen wall. No matter what they look like, the gates of honor represent the work of Jiading craftsmen as well as Jiadingers’ faith and character. 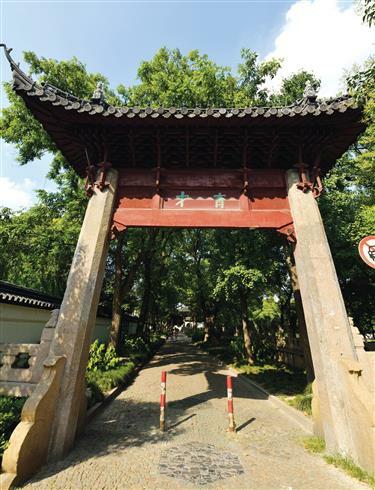 At the former residence of Yin family in Jiading Industrial Zone, a gate of honor is dual sided. It is well preserved together with the old mansion and considered the biggest gate of honor in the district. It has ornamentation on both sides and features a single roof and upturned eaves. The clay lotus installed on both ends of the vertical ridge symbolizes more children. Family notable Yin Youmo is the former general manager of The Commercial Press and the line is Yin Youmo’s true portraiture. He introduced advanced equipment, trained workers and initiated a large scale of translation of Western books after he took the office in the early 1900s. He later established the distribution office of the press and make The Commercial Press become the best and biggest printing house throughout the country. A gate of honor in Dayu Village in Jiading New Town is one of the two existing gates of honor in Jiading’s rural area. It has a gable and hip roof with upturned eaves. There were clay sculptures on both ends of the vertical ridge, but they have already been destroyed. The upper part of the gate has flower patterns which symbolize an old Chinese saying “Flowers bloom while all things return to spring.” The middle part of the gate features the pattern of lions playing with an embroidered silk ball. Both the lion and the embroidered silk ball are auspicious symbols in ancient China. They are also guardians to ward off evil spirits and emblems of power. The stele on the gate says “Elevating to glory and honor.” The line echoes with the pattern of “carps leap over dragon’s gate” beneath the stele while both of which are symbols of the family’s best wishes for the descendants to pass the imperial exams to become officials of the empire. A gate of honor in Xingta Village in Anting Town is plain-looking. It serves the former residence of the Zhou family and was built in 1924. Next to the gate is a well with two Chinese characters engraved on its loop which mean “Thinking of the source.” The stele on the gate says “Running a long course from a remote source.” Both symbolize the family hope that descendants never forget their roots and will always be grateful for favors received. A gate of honor in Xiaomiao Village in Xuhang Town is around 250 years old and all that remains of the Ji family residence. The residence of the Ji family was destroyed during the Battle of Songhu in 1937 but the gate survived. The gate of honor in the Chun’ai Hall in Loutang Town says “Bamboo at sprouts while pine trees flourishing” to mark the establishment of the house. 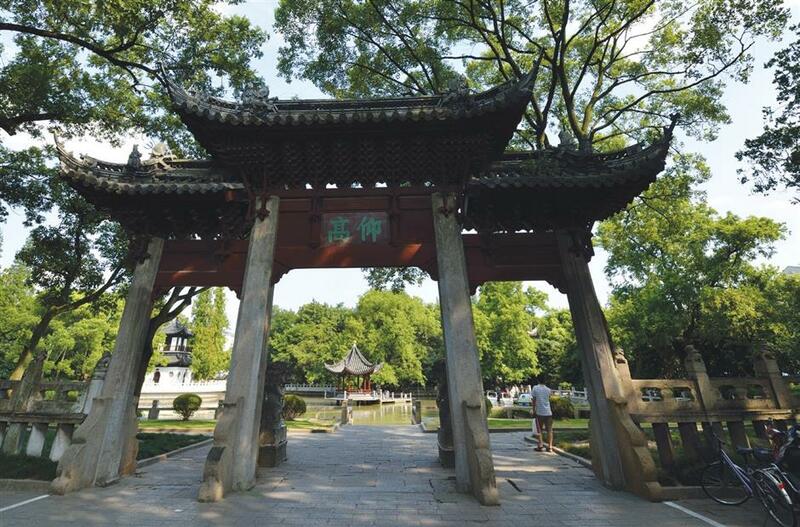 This gate of honor is the best preserved in Jiading. 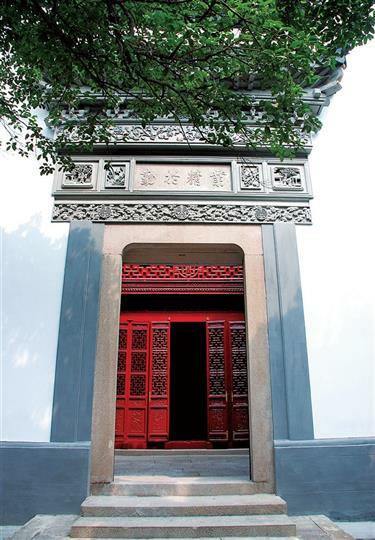 The gate of honor in the Chun’ai Hall in Loutang Town is the best preserved one in Jiading. The patterns of plum blossom, orchid, bamboo and chrysanthemum on the upper fillet symbolize the family’s vision that the descendants will live a life of noble character. The stele says “Bamboo at sprouts while pine trees flourishing” to celebrate the establishment of the house. There are also several lines on the lower fillet to manifest the family’s noble character and tradition of classical learning. Loutang is a commercial hub in north Jiading. People previously traded textile and agricultural products here. There were hundreds of dealers as well as myriads of pedlars. The Tang family, which owned Chun’ai Hall, mainly dealt in groceries and made a fortune. The gate and the hall are silent witnesses of the family’s glory days as well as the prosperity of Loutang. A gate of honor in Waigang Town was part of the former residence of the Yang family. The clay pine trees, bamboo and plum blossoms on the upper fillet manifest the family’s pursuit of a noble character as well as best wishes for an evergreen family tree. The stele on the gate says “Keeping on the right track” which verifies noble acts by a family member. 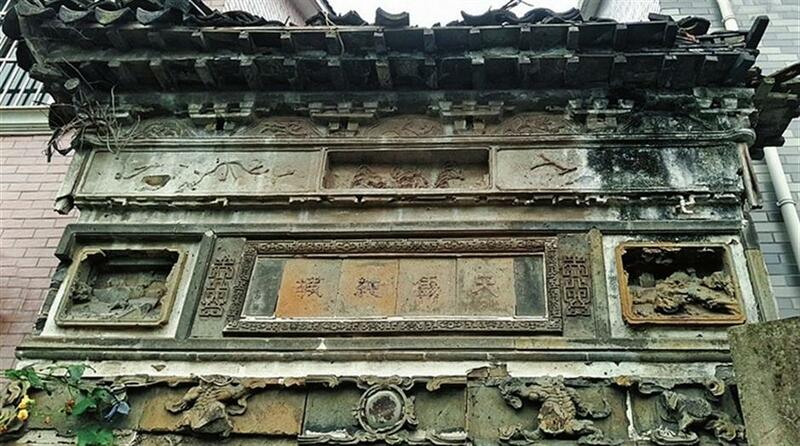 At Laodongjie Street in the Huangdu area, there is a gate of honor set up on the wall of an old residence. The residence of the Xia family was built in 1869. It was also home to martyr Xia Caixi (1906-1939), a member of the Communist Party of China during its early days. The gate has a gable and hip roof. Patterns of gourds on the upper fillet symbolize a flourishing family, fortune and prosperity. The stele says “Fragrant osmanthus and orchid” which means to live in grace or to have noble and worthy progeny. 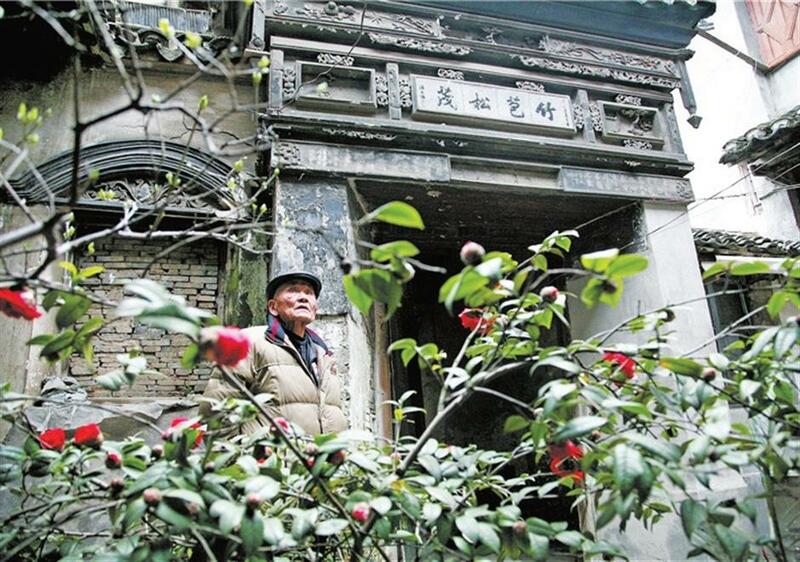 Xia Caixi, who lived here, was a senior executive of the CPC and took part in the Long March in 1934. He went to Moscow and studied at the International Lenin School after that. Xia died in 1939 in the Soviet Union.